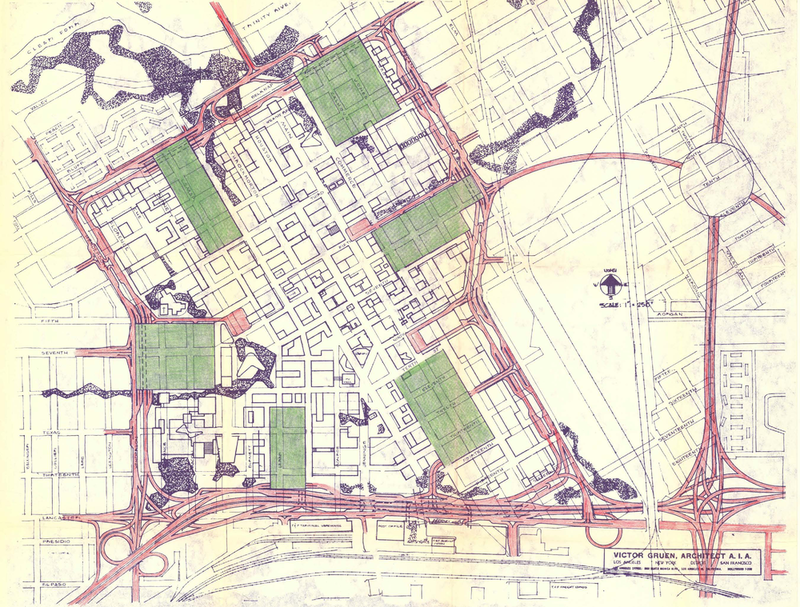 Victor Gruen was hired in the 1950's to create a plan that would solve the traffic problems of downtown Fort Worth. The roads of the city were designed in the horse and buggy days, not to handle 70,000 cars a day in 1959 and certainly not the 152,000 cars projected by 1970. What he developed was a series of six large parking garages on the periphery of the downtown core which would provide pedestrians no more than a 2.5 minute walk to the business district and shopping area. No vehicles would be allowed beyond these parking garages. All deliveries would be made by way of underground tunnels and traffic would circulate around downtown by a ringed highway. The loop highway was one of the only parts of this plan built. This plan was hyped up for months, much like the debate about where Amazon will choose to locate their next headquarters. Citizens in the U.S. only knew that Gruen was working on a plan for mysterious City X. They formally announced it was Fort Worth in March of 1956. Gruen believed that traffic would suffocate the central business core and that the city should be free of "noise, fumes, and congestion created by traffic." Gruen was experienced in designing shopping centers and was responsible for the largest shopping center in America: Northland Shopping Center in Detroit. He used ideas from the traditional shopping center to create the plan for Fort Worth. Like a standard shopping center, pedestrians have free reign to walk in front of shops without considering traffic. In conjunction with banning cars, he also envisioned a series of skyways to connect the buildings on the 2nd level. The only problem with skyways is that they take away fresh air and the ability to mingle and talk with others. Skyways are too narrow and do not have benches for seating nor is it encouraged to loiter. The plan to fund this creation was to use parking fees in the garages, sell unnecessary right-of-way for new building construction, and the increased tax revenue from more commercial businesses investing in the area. Despite all the planning, the business owners in downtown Fort Worth blocked the plan. Over 50 years later the City built Sundance Square, a modified version of the original plan. Within the 35 block pedestrian focused area is a two block long public square, void of all traffic. Opened in 2013, the space has a permanent stage for concerts, outdoor movies are shown, there are fountains, 4 giant umbrellas, and a rent-able pavilion. No city has taken this plan and implemented all the ideas, but as Minneapolis has show, parts of it have been adopted over time. They have even have adopted the highway ring around the city with the 1950's era highway construction. With a few more parking garages on the edges, Minneapolis, among many other cities, could take this progressive 1959 idea and make it a reality.